Whoo! We needed something to get our blood moving again. Today the PRICE OF GOLD finally broke its losing streak, bumping up $9.20 to $1,078.00 on the Comex. SILVER leapt 16.2 cents to $14.242, up to $14.28 in the aftermarket. Cyclically both are due for a low sometime in the latter half of November. Over Tuesday, Wednesday, and Thursday the PRICE OF GOLD made a bowl bottom. Lip of that bowl stands about $1,078, through which the gold price passed today, then touched back to make sure. Whether this will last or not — and we may have seen the bottom on Tuesday — gold will rise for the next few days. Must first push through $1,100.00 to prove it has any nerve at all. 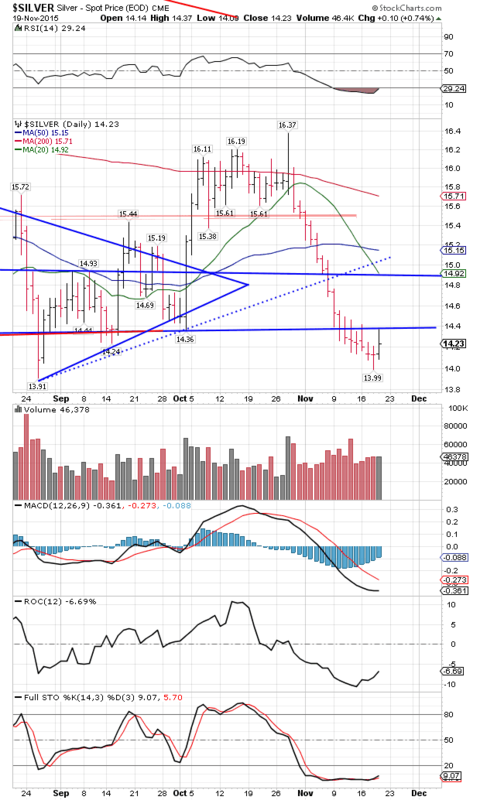 The SILVER PRICE five day chart sports an upside down head and shoulders with a head/bottom yesterday. 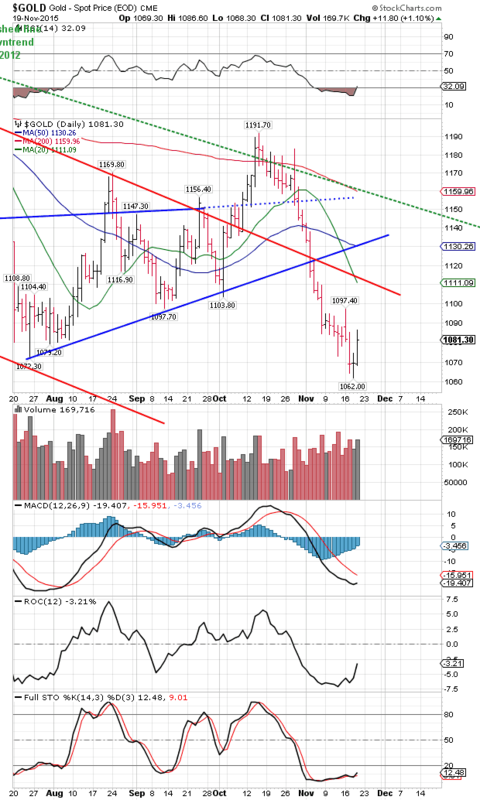 Doesn’t prove yesterday was THE bottom, only says silver will rally at least a few days. Believability and durability doesn’t come until silver crosses first $14.40 then $15.00. Coincidentally, the 20 DMA right now stands at $14.92. So far we have a double bottom July and November with intraday lows at $13.91 and #13.99. As with the gold price, the rate of change and full stochastics have turned up, but not yet the MACD, quite. GOLD/SILVER RATIO is acting consistently with an upward reversal in metals. That is, it topped 4 days ago and has since declined. Needs now to close below the 50 and 20 DMAs, not intertwined at 74.66 and 74.51. Indicators are rolling over downward. Today we got proof. Not a lot of proof, but sound and promising more. If you’ve been itching to buy, time to start. I believe those folks waiting for $750 gold price and $10 silver will be proven wrong, but mercy! What in the world do I know? I ain’t no more than a nat’ral born durn fool from Tennessee, so far back in the woods we have to order sunlight from Sears and Roebuck. Stocks were markedly less jubilant today than yesterday. Fact of the business is, they performed miserably. Four times the Dow and S&P500 tried to pierce the unchanged line, four times they were driven back. With a mid-day high, looks awfully toppy. This schizophrenic on again, off again belongs to the volatility of a trend-changing market. Bulls remain hopeful and buy on any spur, but can’t make good that progress, so the sellers win again. Dow lost 4.41 today to 17,732.75. Not much, but symbolic. S&P500 lost 2.34 (0.11%) to 2,081.24. Dow in Gold and Dow in Silver both hooked down today and appear — O, mercy! — appear to have turned down. If so, that leaves behind double tops in both, which, although painful to live through, puts a firm cap on stocks’ advance against metals since 2011. Lo, the US dollar index topped yesterday, according to the 5 day chart. Then on the longer term chart it fell through the uptrend line, which pretty well locks in the break. Careful, I’m not saying it has reversed its longer term, only reversed for a correction. It would have to fall below 96.50 to bring that longer term upward trend into question. Dollar index fell 69 basis points (0.7%) to 99.05. Euro took that opportunity to sneak up 0.68% to $1.0734. Yen rose 0.63% to 81.40. Those last two remain dead broke, destined for lower things.